Crude oil surpassed hydrocarbon gas liquids (HGL) to become the largest U.S. petroleum export, with 1.8 million barrels per day (b/d) of exports in the first half of 2018. U.S. crude oil exports increased by 787,000 b/d, or almost 80%, from the first half of 2017 to the first half of 2018 and set a new monthly record of 2.2 million b/d in June. Much of this crude oil went to destinations in Asia and Oceania such as China, South Korea, and India. Europe was the second-largest market for U.S. crude oil exports, led by Italy, the United Kingdom, and the Netherlands. Canada was the only major U.S. crude oil export destination where exports decreased, down slightly in the first half of 2018 compared with the same period in 2017. The United States exported 7.3 million barrels per day (b/d) of crude oil and petroleum products in the first half of 2018, the largest amount of crude oil and petroleum product exports ever for the first six months of a year. During this period, exports of crude oil and HGL set record monthly highs. 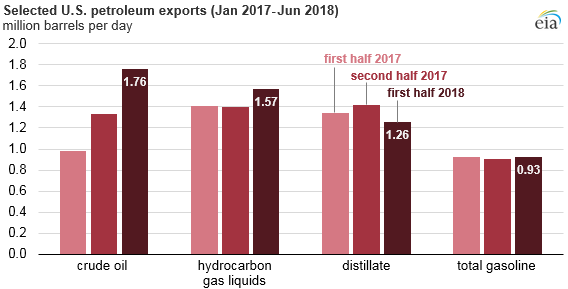 U.S. exports of crude oil, HGLs, and motor gasoline grew in the first half of 2018 compared with the same period in 2017, while distillate exports decreased. HGLs—including propane, ethane, butanes, and natural gasoline—were the second-largest petroleum export from the United States in the first half of 2018 at 1.6 million b/d. As with crude oil, destinations in Asia and Oceania such as Japan, South Korea, China, and India were also the primary recipients of U.S. HGLs. These countries have expanded petrochemical facilities that import U.S. HGLs as a feedstock. Overall U.S. HGL exports set a new monthly record at 1.7 million b/d in May. In the first half of 2018, the United States exported 1.3 million b/d of distillate, primarily to destinations in Central and South America. 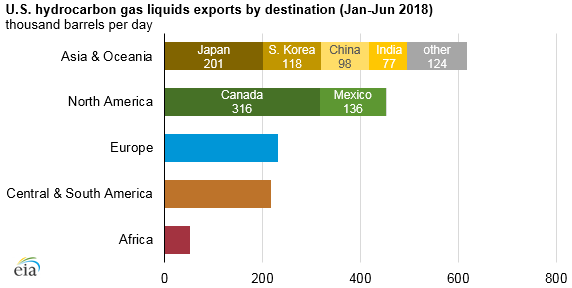 The decline in U.S. distillate exports in the first half of 2018 compared with the first half of 2017 was mostly the result of lower exports to a number of destinations in Central and South America and in Europe. However, U.S. distillate exports are typically higher in the second half of the year. Compared with other petroleum exports, U.S. distillate exports go to the most destinations: 49 different destinations received at least 1,000 b/d of U.S. distillate in the first half of 2018. The United States exported 913,000 b/d of motor gasoline in the first half of 2018, an increase of 144,000 b/d compared with the same period in 2017. 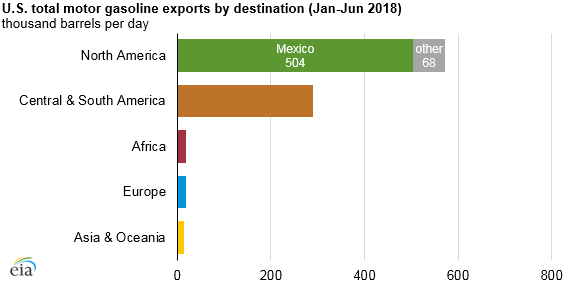 More than half of U.S. motor gasoline exports went to Mexico in the first half of 2018, the largest to a single destination of any U.S. petroleum export. Mexico has relatively low refinery utilization rates and in recent years has increased imports of motor gasoline and other petroleum products from the United States. The 504,000 b/d of gasoline exported from the United States to Mexico in the first half of 2018 was equivalent to more than 60% of the gasoline consumed in Mexico in those months.